The stock market will be more selective in 2019 and in a stock picker’s market there will be many opportunities to outperform indexes. The year 2018 will be remembered as the year when downside volatility thundered into the market in striking contrast to 2017 when stock market volatility was so meek that it subsided to a level below that of bonds for the first time. The final month of 2018 was different. The bear swooped down faster on the stock market than a fly on a honeypot. In fact, the precipitous decline in December right up to Christmas was so sharp and persistent that it was hard to find a recent comparable meltdown. The month of December is usually amongst the seasonally strongest in the year, but in 2018, it turned out to be one of the worst since 1931. As the major stock indexes slipped in-and-out of a bear market, it is clear that 2019 is presenting unique challenges, which will make it a more selective stock picker's market. The stock market was on track to deliver a solid double-digit return performance in 2018 until the final quarter began. The double-digit gains melted away rapidly and 2018 closed with all major indexes recording negative returns. Financial markets often defy logic, particularly in times of stress. The dramatic slide in the final months of 2018 was exacerbated by a confluence of events, which spiked uncertainty but were not an immediate economic threat. Nonetheless, the uncertainty was severe enough to push the stocks into a bear market territory, with all indexes declining 20% or worse. Some of the key market influencing issues, like the China trade friction, will persist into 2019. It will be helpful to track where the three key pillars of the stock market - earnings, economy, and the interest rates - are expected to stand during 2019 in order to arrive at some framework of where the stock market is heading. Things are not as bleak as the market has been fearing. We believe the Bull survives for the reasons laid down below, though it will have to fight harder. The sharp pullback in the stock market was led by fear of a recession, but instead, it has been a rapid recession of confidence - in the economy, in the Fed, in global growth, and in the administration policies, all combining to create a vortex of volatility. Investors have to evaluate whether the step-down in economic growth during 2019 is a gentle drifting towards moderation from 2018 levels or a precipitous and cantankerous slide towards the calamity of an economic recession. The stock market reaction witnessed during December suggested a more ominous scenario being embraced by investors, driven by the rise in uncertainty and negative sentiment, as explained in the article, We Got Ourselves A Bear, Now When Is The Recession. However, some of the key benchmarks of the economy are not exhibiting the characteristics associated with an imminent recession. The economy is expected to drift down from the growth rates experienced during 2018, primarily due to the effect of a tax cut boost wearing-off. There are no indications yet that the 2018 tax cuts have transformed the business spending cycle to a higher level in a more permanent way, one of the pivotal arguments offered to justify the tax cuts, which can continue to keep economic growth closer to 3% or higher. Consequently, there will be a step-down in growth during 2019, as the boost from the tax cuts proves to be short-term. However, business spending does not appear to be on a path to a recession at this point. The risk of the economy slipping towards 0% growth during 2019 or early 2020 is highly contained at this time since consumer spending, business spending, and employment rate remain close to highs. It is our belief that the economic growth will settle in the 2% to 2.5% range during 2019 and thereafter, edge lower towards the vicinity of 1.5% in 2020. This scenario is not as good as 2018 growth but is not bad either and to some extent will mirror the period prior to the 2018 tax cuts. Corporate earnings for S&P 500 grew at a 25% average pace during the January to September 2018 period. The surge was assisted to an extent by the corporate tax cuts. However, even operating earnings grew at an over 20% pace, as the economy strengthened and global growth remained intact. Things are changing though and in the fourth quarter, S&P 500 earnings growth expectation has declined to an 11% rate. Most likely, the earnings for Q4:2018 will be around a 15% growth rate, as per FactSet. It is clear that the S&P 500 earnings growth rate will shift lower in 2019. At the operating level, earnings will be affected by a step-down in economic growth as well as pressure on exports as key international economies continue to witness moderating growth rates. At the net income level, the benefit from a lower corporate tax structure will not be there this year, like it was in 2018, making for a difficult comparison. Furthermore, as the boost from tax cuts expires, it will reduce the corporate liquidity available for buybacks from the 2018 level. Earnings of S&P 500 companies for 2019 are expected to grow at 7.9% presently, as per FactSet. Companies with less than 50% exposure to international markets are expected to grow earnings at a somewhat higher pace of 8.4%. This will suggest that companies which derive most of their revenues from the domestic US market, like the small caps, will benefit more in an environment of moderating global growth and a stronger dollar. Interestingly, FactSet estimates that net margin, based on present revenue and earnings growth, can be 11.8% for 2019, which will mark an all-time high since the service began tracking the statistic in 2008. The ability of the S&P 500 companies to preserve and raise margin even in the face of tariffs suggests that a trade war resolution will have the potential to further improve margin and, consequently, earnings growth. The S&P 500 earnings growth rate in 2019 will fall to what is eventually expected to be a 10% rate, but it won't plummet into a contraction. This is not as robust a situation as in 2018, but neither is it a dire situation particularly after a steep pullback with S&P 500 trading at an earnings multiple of less than 15x based on an EPS of $176.50 in 2019. The earnings season picks up momentum over the next 4-weeks and the guidance will shed light on the robustness of this estimate. The Federal Reserve monetary policy on the future path of interest rates continues to be a highly sensitive subject with investors. Since persistent rate hikes can lead to an over-tightening at a time when the 10-year old expansion is going to negotiate the dropoff from a tax cut boost and a synchronized slowdown in key economic blocs, the concerns of a recession are legitimate to a certain degree. The Federal Reserve appears to have recognized the sensitivity of the market. Chairman Powell, who has had a tough time getting the unscripted comments right from a market's perspective, finally achieved the right notes last week in Atlanta, as he was abundantly clear about the Federal Reserve open to adjusting interest rate policy based on data and economic conditions, rather than being on a preset rate hike policy. Interestingly, on December 19 in his press conference, Chairman Powell had a similar message like the one last week but it was lost in the din of the "balance sheet runoff on automatic pilot" comment. This goes to show the depth of fear and negative sentiment that existed during December, which overlooked the same core message. It also goes to show the risk that is inherent in the market today that perhaps we may always be one comment away from recreating the December apocalypse again. However, it does seem that the Chairman of the Federal Reserve has learned a lesson - the importance of emphasizing and repeating soothing commentary in times of irrational fear and not interspersing it with anything that may be considered as adverse. But only time will tell how true it is. Official expectations for interest rate hikes during 2019 have come down from 3 to 2, and most likely will be trimmed to 1 as the year progresses. 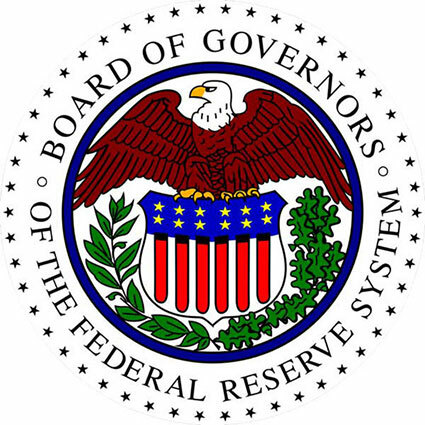 A Federal Reserve on the sidelines with regards to interest rates is the best thing a stock market can expect in an economy that is still growing. 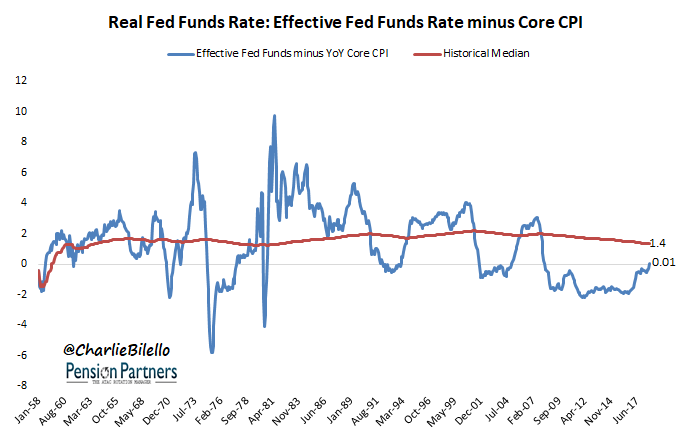 The real effective Federal Funds Rate is around 0%, and that augurs well for growth. We believe Federal Reserve monetary policy, a key plinth of the stock market, which was showing stress and cracks in its support, now leans favorably for market valuations. This is a critical shift in terms of managing market volatility, particularly as the other two key supports - the economy and the earnings - face a weakening from the 2018 level. The stock market entered bear market territory in December. The decline from recent peaks to the lows recorded on December 24 and 26 have been sharp and steep, going over -20%. In a non-recession related bear market, the typical decline is around 20%, like in 1998 and 2011, and not an average recession-related bear market decline of 37%, as per data since World War II analyzed by LPL Research. Since Christmas, the market has turned around in a V-shaped recovery as risks from the Federal Reserve, China, and the White House have diminished. Trade friction can still create further intense volatility during the first quarter of 2019 in the absence of a resolution. However, the most likely outcome remains that a resolution will be forthcoming, if not in the first quarter, then in the second. This can add to market volatility, but not shift the market trend, particularly if the Federal Reserve avoids hiking rates at the March meeting, and professes to remain on the sideline as economic data evolves. Market sentiment is a fragile emotion that can turn on a dime, as the last quarter of 2018 has shown. The market is in a recovery stage, but that doesn't suggest an end to heightened volatility. At the same time, the big picture, in our opinion, is favorable enough to incrementally increase portfolio exposure, based on one's investing approach. We believe stocks will be a more attractive financial investment during 2019 and anticipate a gain of 10% to 12%. At this point, we expect the first half to be relatively better than the second half of 2019, as the third and fourth quarters can witness rising worries about the economic growth rate for 2020. If the economic data begins to slow down measurably, provoking a Federal Reserve interest rate cut later in the year, then stocks will rally strongly. The stock market will be more selective during 2019, which is characterized as being a stock pickers market. There will be numerous opportunities to outperform the market indexes. Biotech stocks will be strong and present tremendous potential, as detailed in our recent update Biotech Bonanza: 2019 Outlook. However, the drag on the biopharma industry from the increased price related scrutiny by the various House committees and bills proposed by Presidential hopefuls will limit biotech returns during 2019. As we prefaced in the opening paragraphs, financial markets are not easy to interpret and often defy logic. One has to just read the market outlooks for 2018 and before published on this forum, and how they diverged from reality, to realize that no one has a crystal ball that is consistently right. Markets have a way of writing their own narrative. None of our forecasts may come true, and we may remain in the grip of a bear market, never to recover and record new highs during 2019. Markets do not follow a calendar and change character because it is a new year. Furthermore, opinion pieces do not make money, but they provide a framework to view and guide things. Eventually, it is important to work within an investing system and continue to readjust and recalibrate the portfolio as market conditions evolve. 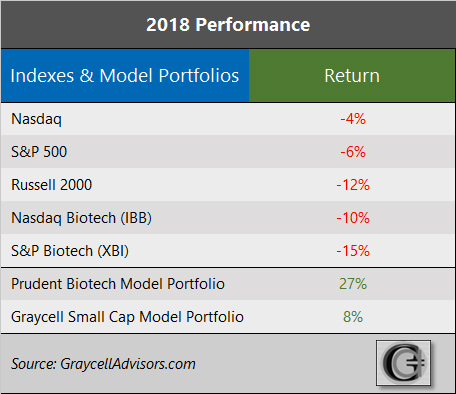 We have used such a quantitative systematic investing system in our Prudent Biotech and Graycell Small Cap model portfolios over the years, and that has worked out well as evidenced by Performance. We do believe a greater allocation to stocks is justified during 2019, as the recent slide has created more favorable valuations and the economic prospects still suggest a healthy growth rate. However, risk has to be managed through periods of high volatility. There are a number of promising companies in the biotech and small-cap segments, some of which may be now or in the past part of the model portfolios. A few of them include Vertex Pharmaceuticals (VRTX), Exelixis (EXEL), Regeneron (REGN), Incyte Corporation (INCY), Amarin (AMRN), Argenx (ARGX), Intercept Pharmaceuticals (ICPT), Alnylam Pharmaceuticals (ALNY), Denali Therapeutics (DNLI), Akcea Therapeutics (AKCA), Ionis Pharmaceuticals (IONS), Arena Pharmaceuticals (ARNA), BioScrip (BIOS), Ra Pharmaceuticals (RARX), Tandem Diabetes Care (TNDM), CareDx (CDNA), Xperi Corporation (XPER), Vanda Pharmaceuticals (VNDA), BioCryst Pharmaceuticals (BCRX), Fate Therapeutics (FATE), Gol Linhas (GOL), Cronos Group (CRON), Vericel Corporation (VCEL), Gold Fields (GFI), Array BioPharma (ARRY), and Mirati Therapeutics (MRTX). Author's note: As always, kindly do your own due diligence. This is just a general opinion piece.